Fun colors make almost anything look delicious. I use a lot of silicone baking cups to entice my kids to eat. This tortilla wrap is leftovers from last night’s dinner. I used Rudi’s Organic brand whole grain wraps. Inside are romaine leaves, fresh roma tomatoes, barbeque black beans with onions and tofu. I used a recipe from Robin Roberston‘s Vegan On The Cheap cookbook. Above the wraps is a little silicone square of Go Raw brand coconut cookies. This dinner is one I double the recipe for to save time, and the leftovers taste better the next day. 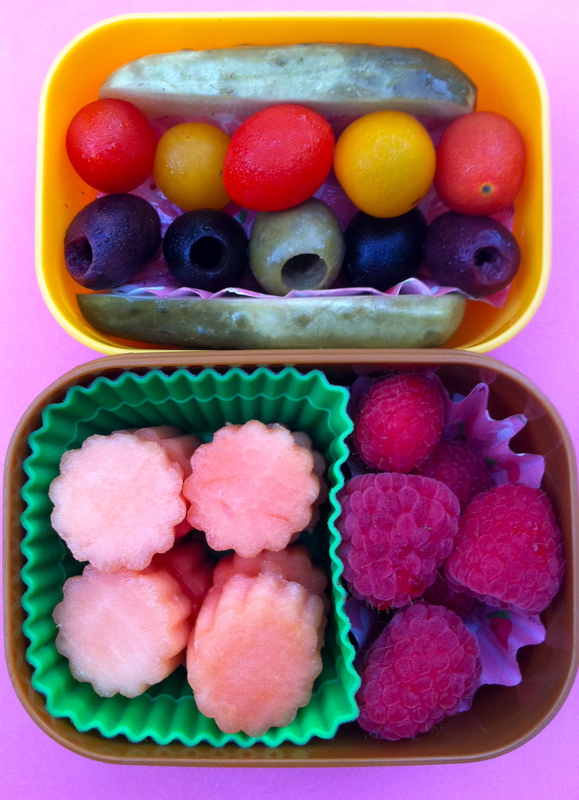 I included a clementine orange in the top left compartment and in the top right of her Easy Lunchboxes container are honeydew melon pieces. 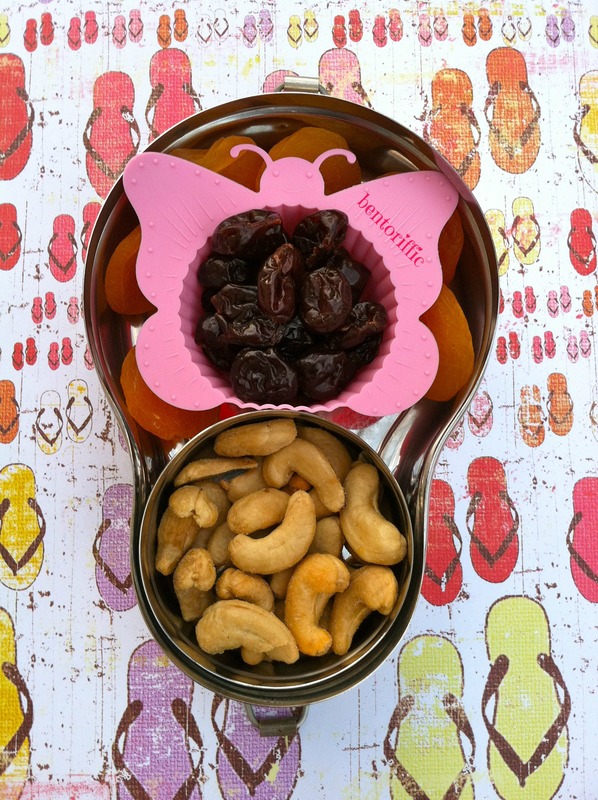 For her snack today, Miss G has a Happy Tiffin stainless bento box with cashews at the bottom, a butterfly cup with dried cherries and underneath the cup are dried apricots. For my almost 3 year old’s lunch, I made an open faced heart sandwich on Rudi’s Organic whole wheat bread with Justin’s almond butter spread and strawberry heart halves on top. Above that in the silicone cup is a peeled clementine with a leaf pick. In the top left of her Easy Lunchboxes container are Go Raw brand Super Cookies made with all organic coconut, sprouted sesame seeds and dates for her gluten free, nut free snack. 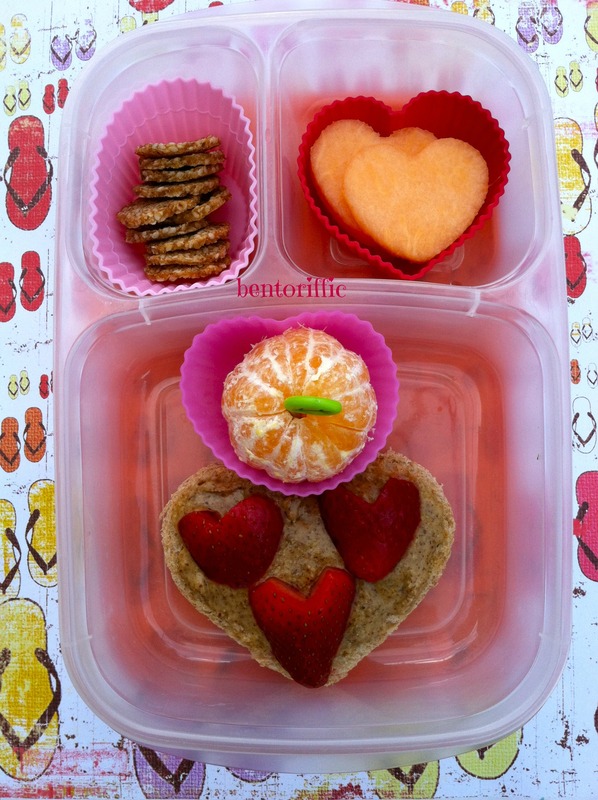 And in the top right heart silicone cup are cantaloupe hearts. Both girls have ice waters with their lunches. Today I made black bean wraps for the girls. I used raw, organic sunflower seed spread on Rudi’s Organic Wraps. I julienned carrots and cucumbers and topped then black beans. I roll as tightly as I can and I stick them in the refrigerator so they’re cut more easily without falling apart. It also helps to put a pick through the rolls to hold them together so the kids can easily pick them up. In the top left are hat shaped watermelon pieces. And the top right is an apple with the hat cut out and replaced with another watermelon in the middle packed in her Easy Lunchboxes container. Today’s bento snack is a green apple hat with the cutout used from lunch, a peeled clementine, a container of Sabra brand hummus, sesame pretzel sticks and Marcona(Spanish) almonds. 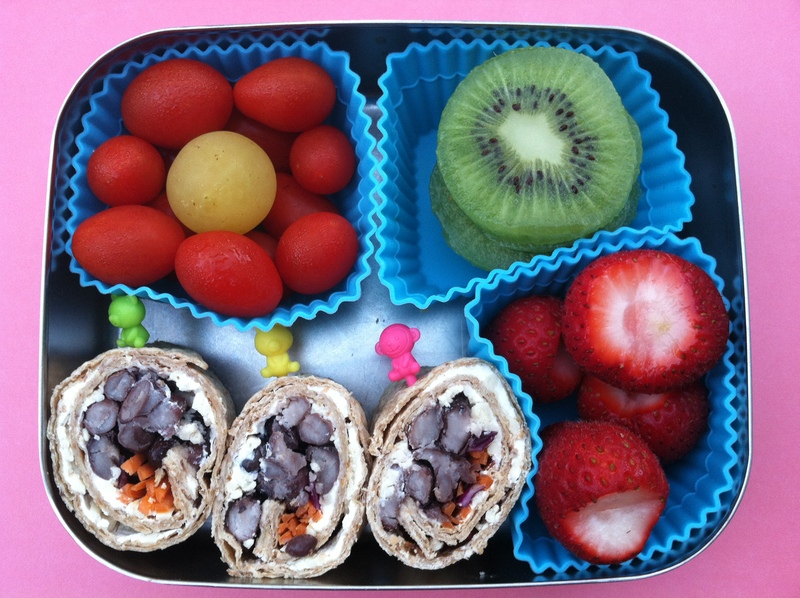 The mini version for my 2 year old is the same black bean wraps on Rudi’s Organic wraps, sunflower seed spread, black beans, cucumbers and carrots with holiday hat picks. One the left are watermelon hat pieces and a silicone pea pod with raspberries, almonds and blueberries packed in her LunchBots Duo. I thought it might be nice to show you how the lunch looks for my 4 year old once it’s ready to go. She has a pink Easy Lunchboxes lunchbox. It easily fits two Easy Lunchboxes. Hers has 2 cooler packs in the bottom, then her lunch, more ice packs and then her CamelBak water bottle, snack bento, napkins with silverware rolled inside, and I pack an oilcloth placemat on top (not shown) before it gets zipped up. I find that packing it tightly means less shuffling of the food, and the food stays better insulated until lunchtime. Today was a leftover day. Come on! I can’t pull out spectacular on a daily basis 😉 I had some Rudi’s brand spelt tortillas and rice with black eyed peas just calling my name from the fridge. So I rolled them up and made them lunch. Miss G is reading now (at 4.5) which means I can’t spell out the things I don’t want her to hear any more. BUT it does mean I can start small with lunchbox notes. I wrote on her clementine today in marker and made a weird looking heart out of it to tell her “I Love You!”. The Goodbyn bynto box fits the water bottle in the middle, and at the bottom are chunks of watermelon and pineapple. 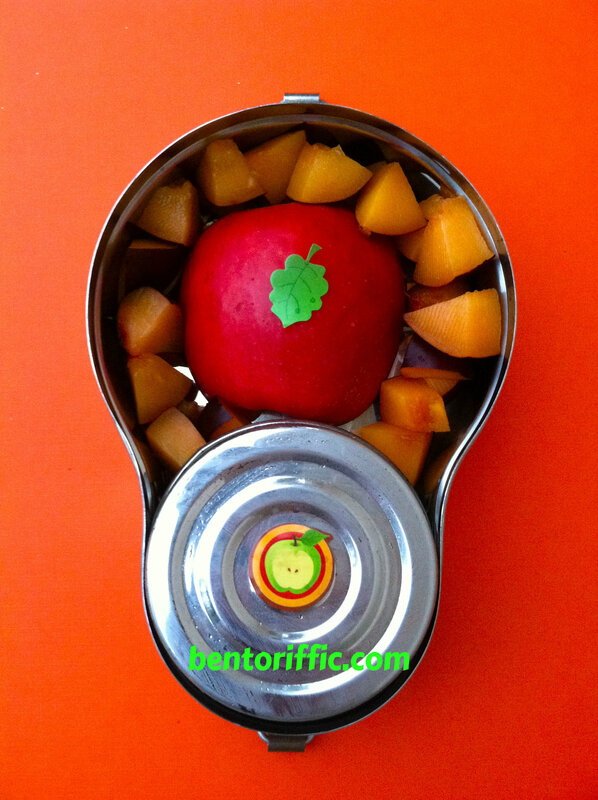 Miss G’s snack is a Happy Tiffin with a half an apple surrounded by pieces of plum. I added a leaf sticker for fun. The round container has apricot mango soy yogurt in it. For her afternoon snack she has a pickle with black and kalamata olives on top and the top container is full of mini carrots. Miss A has a simple lunch today. 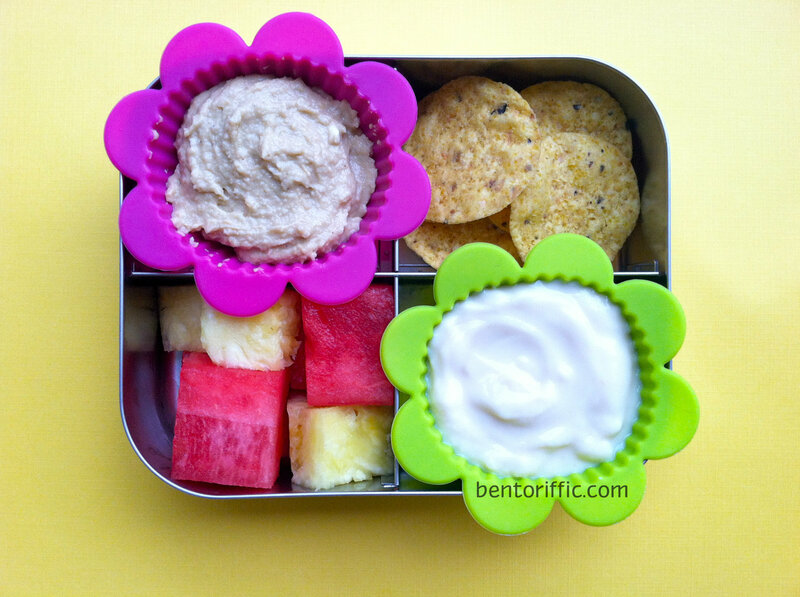 From the top left are a pink flower of plain hummus, organic corn chips, strawberry soy yogurt and pineapple and watermelon pieces packed in her LunchBots container. Not shown are organic gala apples for little Miss A’s class snack. 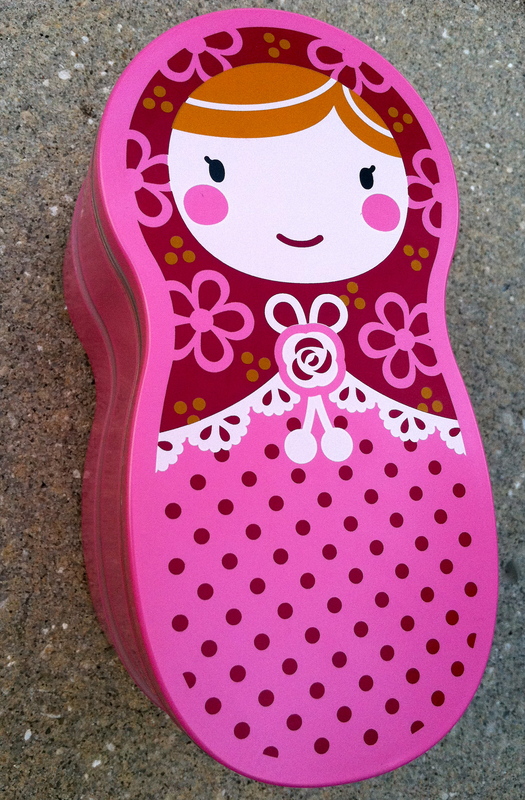 We are big fans of matryoshka dolls (Russian nesting dolls) here. 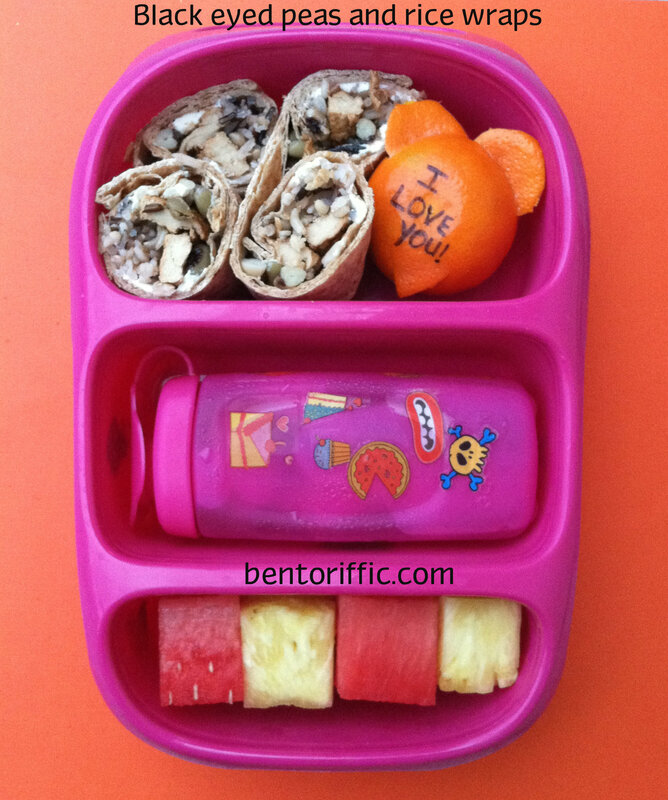 I think I was more excited than my girls to have found this 2 tiered bento box on line. 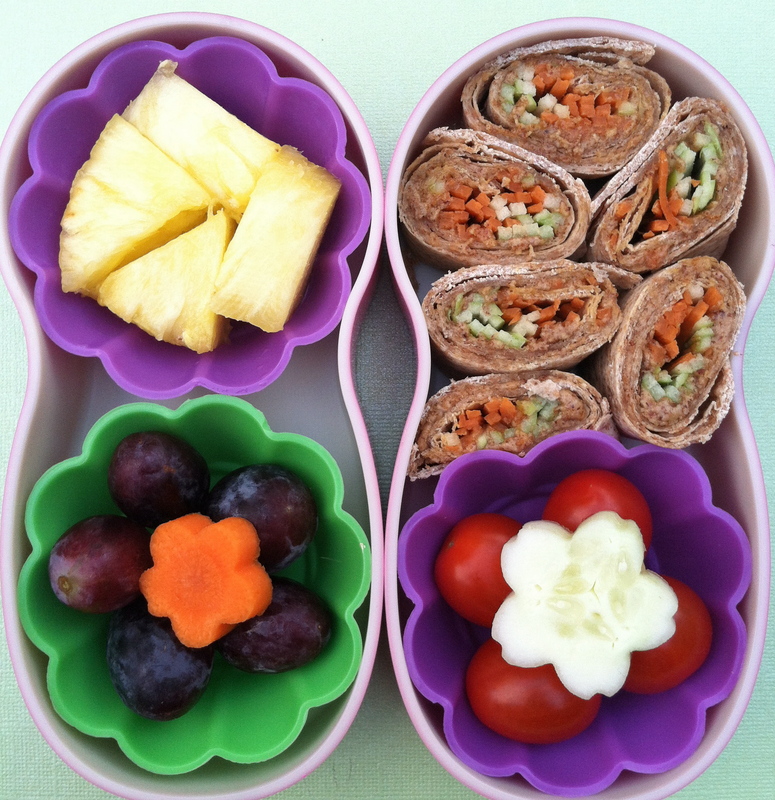 Little Miss 4 year old had her new bento box today full of fresh fruits and vegetables. On the left are pineapple chunks and red seedless grapes with a carrot flower on top. One the right side are Rudi’s brand spelt tortilla wraps with almond butter, carrots and green apples julienned and sliced with cherry tomatoes and a cucumber flower below. 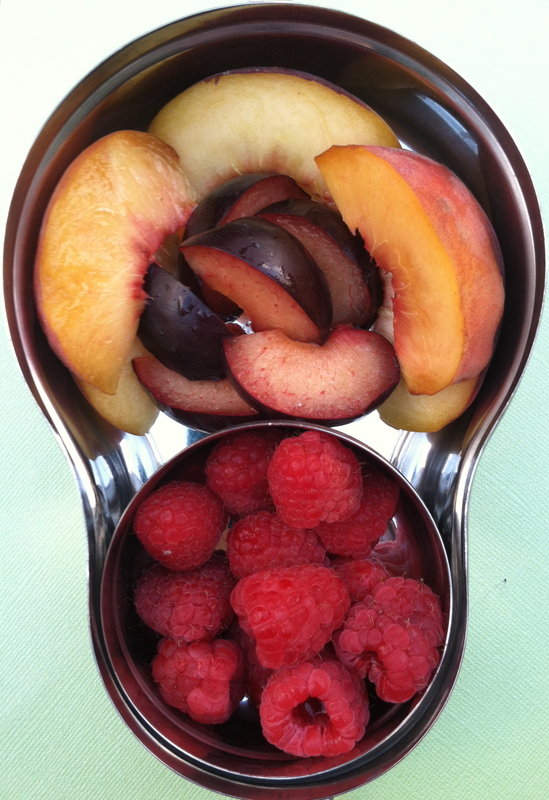 For her snack today, she has a Happy Tiffin packed with organic peaches slices, plums and raspberries. Not shown is her Kleen Kanteen bottle with ice water. Little Miss 2 year old will be back to school next week so I will be a lunch making fool next Sunday night! Enjoying a few extra moments until then. 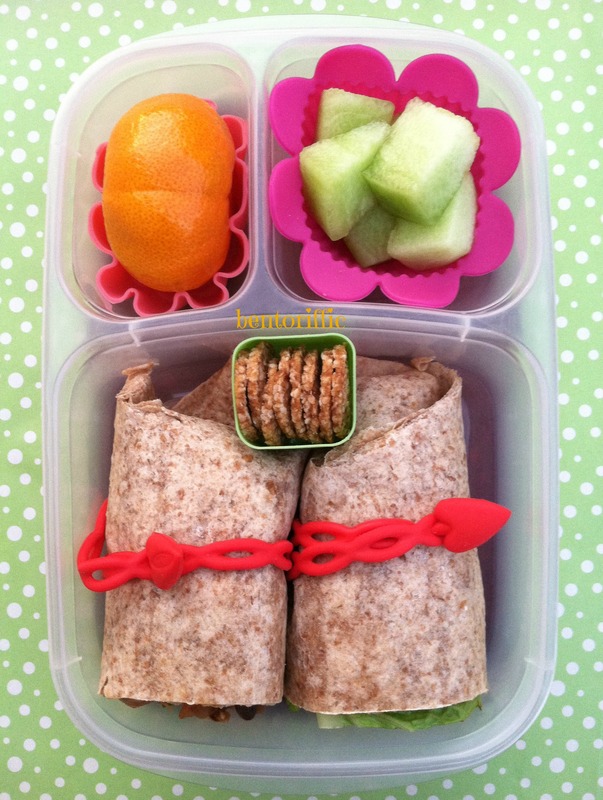 Today I packed Miss G (4) black bean wraps. I used a Rudi’s Spelt tortilla, spread on some Tofutti brand non-dairy cream cheese in a thin layer. I added black beans, a tiny bit of shredded purple cabbage, julienned carrot strips and a tiny bit of Daiya cheese shreds. I rolled it tightly, wrapped it in press & seal wrap whole and refrigerated it overnight. I cut it into small wheels in the morning so it would be easier to cut and stuck in some cute animal picks to hold them together. 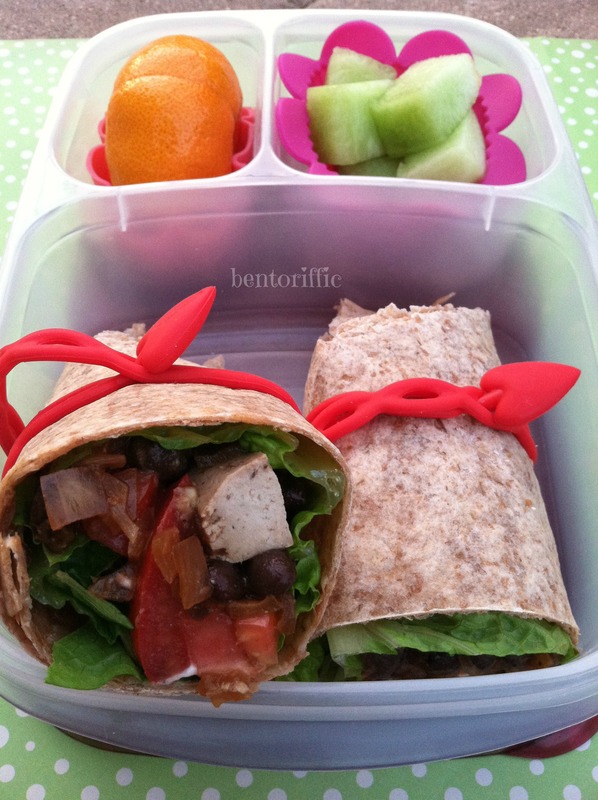 I also included grape tomatoes which she loves, sliced kiwi and strawberries packed in her LunchBots Uno. 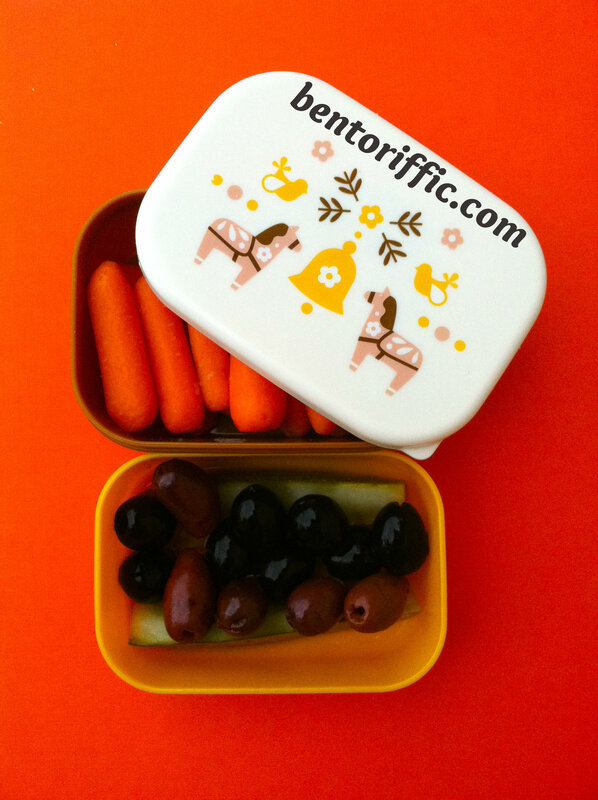 For snack time today I packed her a small, double tiered bento box. In the bottom are papaya flowers and raspberries and the top container has a halved dill pickle, more grape tomatoes and assorted olives.